The Reserve Bank of India has warned citizens that a fake website which poses as an RBI website, is collecting confidential banking details of bank customers. The RBI has noticed that some unknown person has created a fake website of RBI with the URL www.indiareserveban.org. The original website of RBI is https://www.rbi.org.in. The design of the fake website is just like the original RBI website. But, this website has no affiliation to the Reserve Bank of India. The fake website contains a provision for bank verification for online account holders. This is done mainly to collect confidential banking details of the bank customers. RBI has said that responding to such websites will put at risk, personal information and bank account details. This information can be misused. RBI has also confirmed that it does not hold any accounts for individuals and never asks you to share your personal banking information such as CVV, passwords and so on. RBI has been alerting customers on fake websites, emails asking for personal banking details in the name of a lucky dip and fake job offers in the name of government jobs that are cheating customers. Yet, many people fall for such frauds and lose their money. 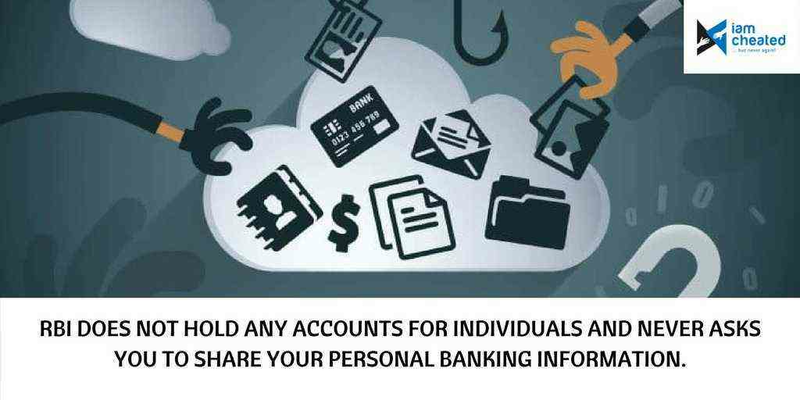 So you should be very careful while transacting online and never share your personal banking information with anyone.